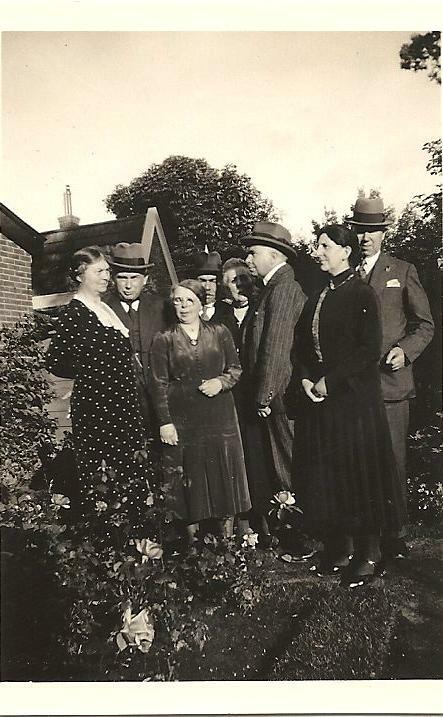 To further translate, Christina Kolle is on the far left, and Halbo Kool (b.1873) is standing next to her. Halbo Kool (b.1873)’s brother Hendrik Kool is the third from the right with wife Irene, but we are not sure which woman she is. Germ Kool and wife Anni (Anna Hebelina Klugkist) are also in the photo, as are host Her(man?) Brouwer and another female. As for the Brouwers, they may be relatives, but I am not sure. They may just be family friends. 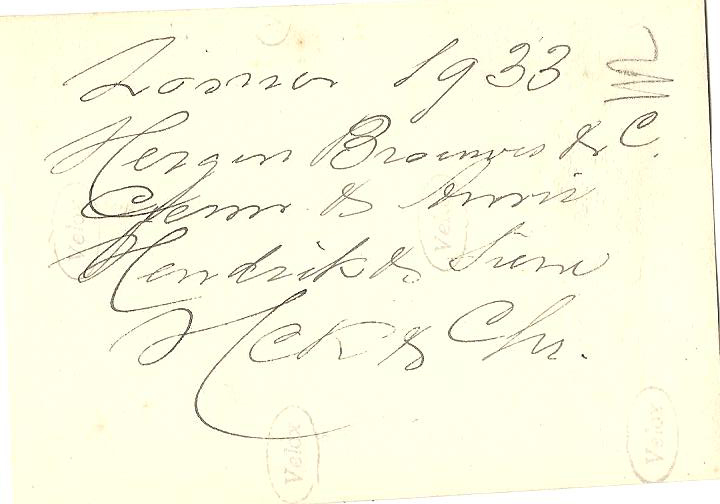 It’s funny, though, because my best friend and I are both interested in genealogy and she recently found some family members in her tree from the Netherlands with the last name Brouwer and so I’ve been on the lookout for connections between our families. Recognize anyone? Let me know in the comments. I’d love to further narrow down who’s who in this photograph. 5. Anna Hebelina Kool (née Klugkist) 1880 -1944 married wirh Germ Kool. Her mother was a sister of Germ’s father. 7. 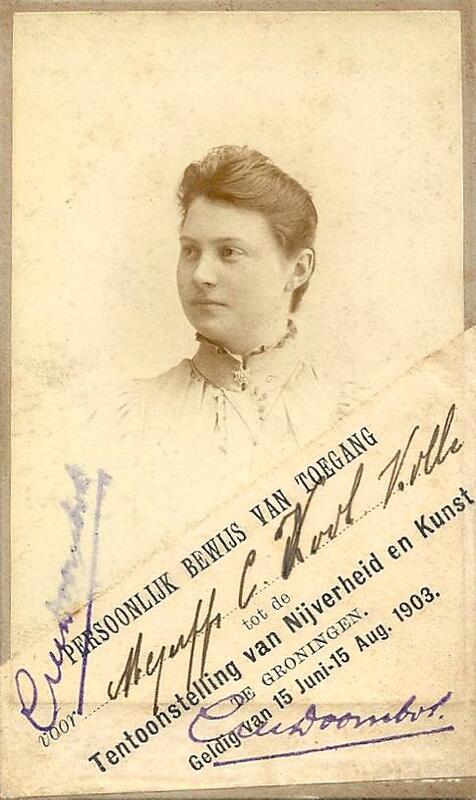 Catharina Brouwer (née Meijer) 1870 – 1948. Married with Hergen Brouwer. 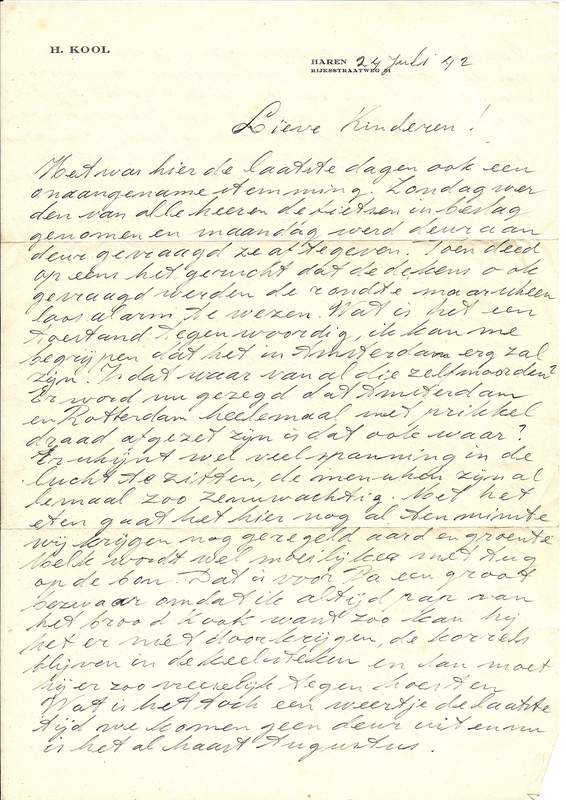 Catharina’s mother was Annechiena Gezina Duintjer, a sister of Halbo Kool’s mother Gonda Margaretha Duintjer. The last few days it was here too an unpleasant atmosphere. Sunday all the man’s bicycles were seized and Monday they asked door by door to hand them over. Then there was suddenly the rumour that the blankets were also asked for but it appeared to be a false alarm. What a situation these days, I can understand that it’ll be bad in Amsterdam. Is it true of all those suicides? People say that Amsterdam and Rotterdam have been surrounded with barbed wire, is that true as well? There seems to be much tension in the air, everybody is very nervous. What can he do with this, perhaps that things are a bit easier for Loes? We’ll do of course straight away the necessary. Monday auntie Trui (Geertruida Kolle, sister of my grandmother) has her birthday and if at all possible I’ll pay her a visit. Auntie Marie (probably Johanna Maria Kolle, another of her sisters) is there and she’ll be able to tell us where we should go (for the information). 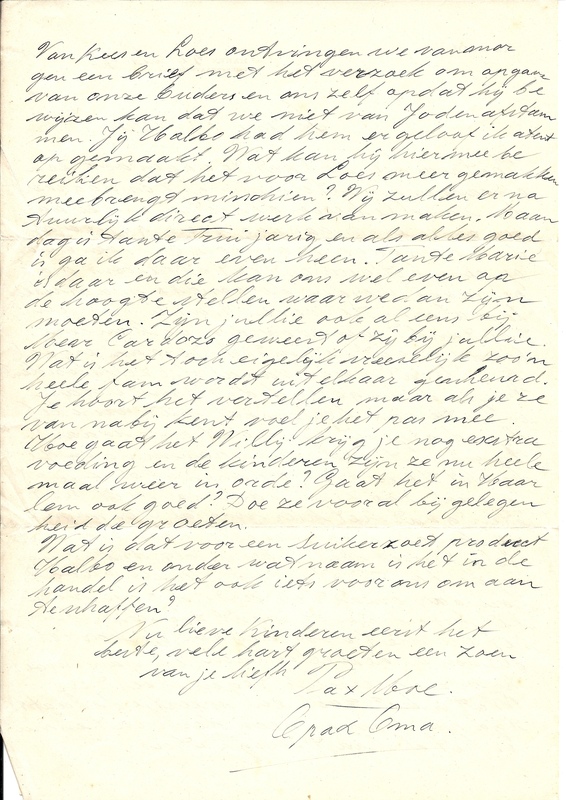 Did you already visit Mrs. Cardozo (should be the mother of Loes, who was sent off to a concentration camp with or like her daughter Frederika, neither returned. This information and the names of the aunties was given to me by Anje.) or she you? How terrible all this is, such a family being ripped apart like this. You hear about such things but if you know the people well, you really feel it. How are you Willy (my mother)? Do you still get extra food and are the children all right again? Are things all right in Haarlem (where Willy’ s parents and sister live). Do give them my greetings when you can. What kind of sugarsweet product is that, Halbo, and under what name is it sold in the shops, is it something for us to buy? I find this letter super interesting because it really reflects the issues of the day. It sounds like Cornelis Kool was trying to arrange it so his wife and family would avoid persecution and execution during the war. One of my uncles had said that was possible because Cornelis worked at a paper mill and the Nazis needed paper; therefore, his family was probably lower on a list somewhere (and speaking of commandeering bicycles, he’d saved for years for the car the Nazis took from him and stayed angry about that for many years after). As for this, though, it sounds like maybe he was doctoring some genealogy records? I certainly would. Editor’s note: The name of Halbo Kool (b. 1973) has been updated in this posting. It was misstated in an earlier version of this post. There’s a good chance the subjects in this mystery photo are directly related to a previous mystery photo subject I mentioned recently on this blog. Both photos came to me through Halbo Kool and both appear to have come from the same place and have similar coloring. In that mystery photo, I postulated that the subject was a brother of Cornelis Kool . 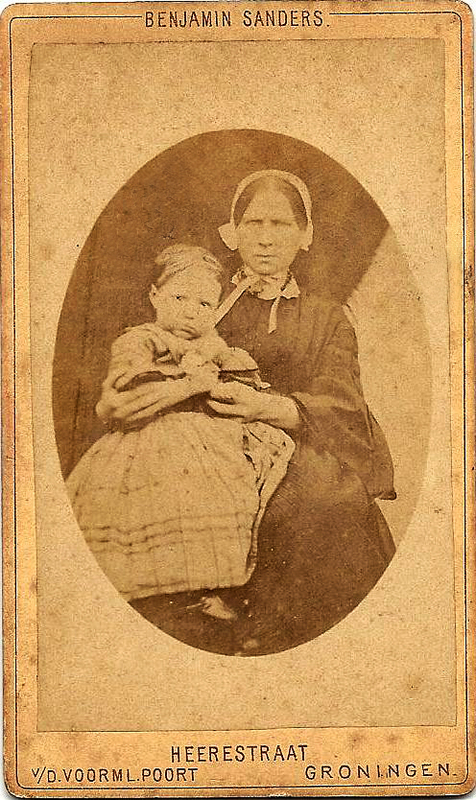 It would stand to reason then that the woman and child in this photo were his wife and child. That’s the best educated guess I have, however, so I’m open to other hypotheses. 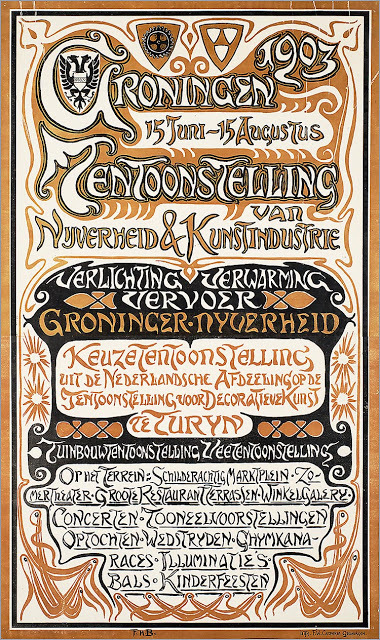 The Groningen Exhibition of Craft and Art Industry, roughly translated, was a big event, seeing about 300,000 visitors over its two-month run from June 15-August 15, 1903. Some accounts have the event running until September 1 of that year, but the official dates on the tickets and poster indicate that it was supposed to end on August 1st. It had a 60-page guide book and a commemorative coin. One would have to cross over a bridge, under a sign that read Tentoonstelling (Google translated: Shows) to enter the grounds. In one courtyard, a giant wine bottle stood two stories high, and in another, a fountain. 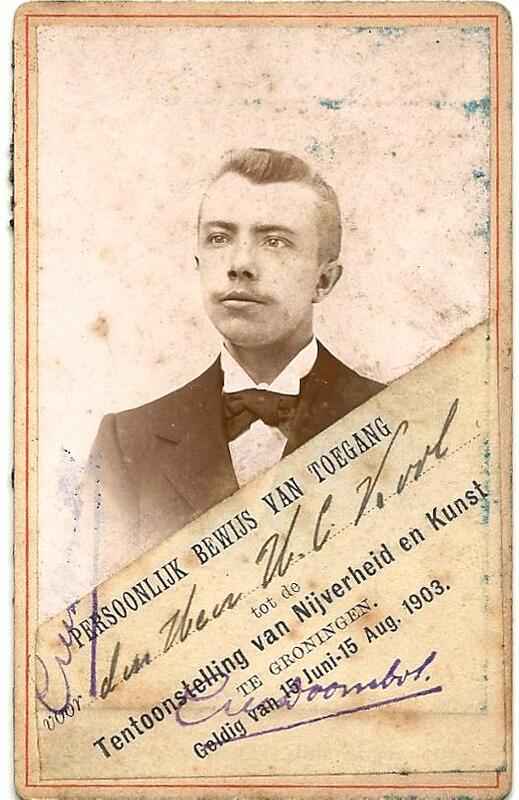 Halbo Kool, the living grandson of Halbo Kool (b.1873) and son of Halbo Christiaan Kool (I know, not confusing at all, right? ), sent me these scans of Halbo Kool (b.1873)’s and Christina Kolle’s permanent passes to the event. In his notes, Halbo Kool says he’s not sure if they have had a stand for the H.C. Kool hat shop, but I’m fairly confident they would have, being located in Groningen and such good business people. 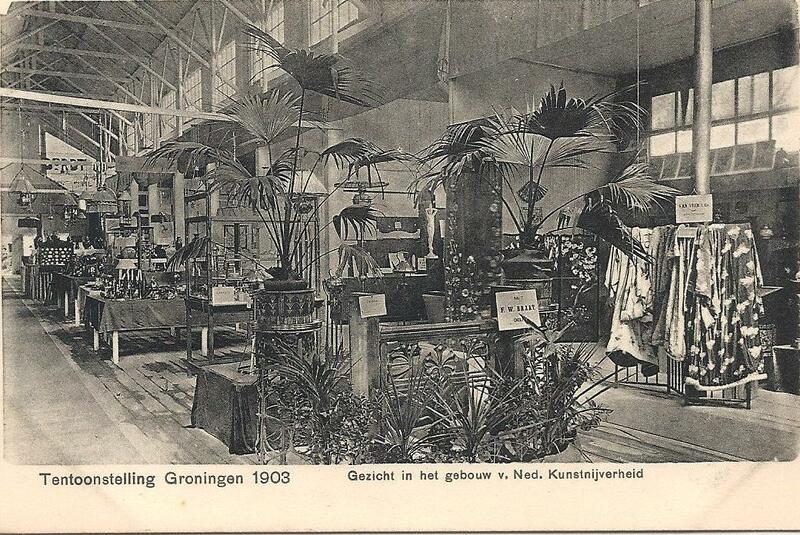 Inside the Groningen Tentoonstelling van Nijverheid en Kunstindustrie in 1903. See a poster for the event here. 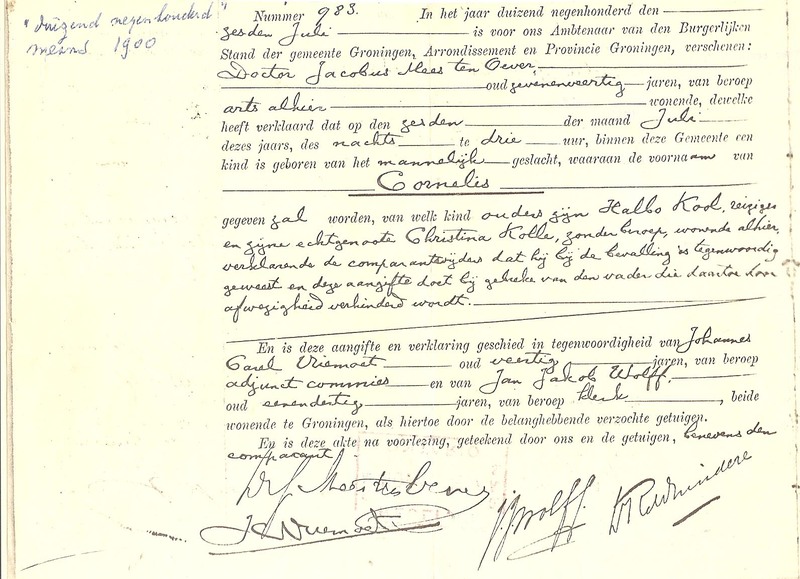 This is a scan of the birth certificate of my great-grandfather, Cornelis Kool, who was born on the 6th of July, 1900, in Groningen, Netherlands, to Christina Kolle and Halbo Kool. This is a portrait of my great-great-grandparents, Halbo Kool (b.1873) and Christina Kolle, courtesy of my cousin Anje Belmon, who in turn got it from her uncle. So now we know where I get my good looks (joking!). According to digital records on Genlias.nl, Halbo was born in Veendam, Groningen, Netherlands, in 1873 and Christina was born in Oostdongeradeel, Friesland, in the same year. 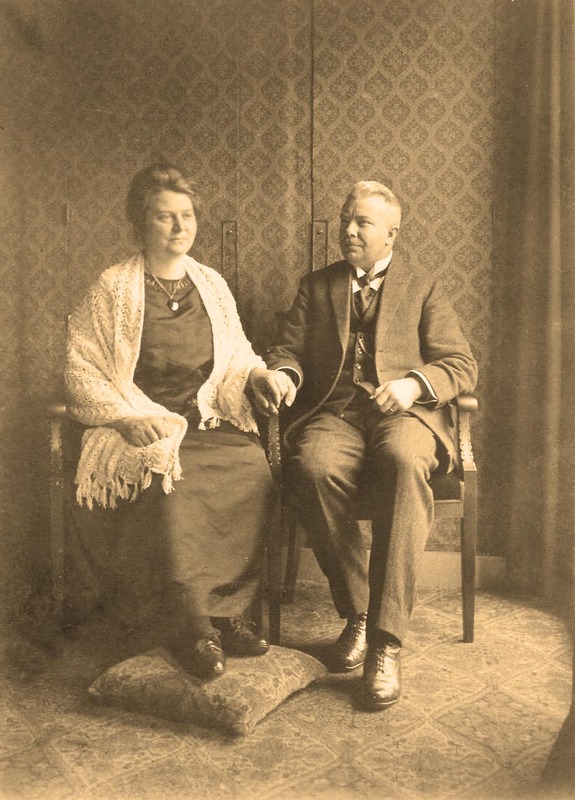 They were married in 1899 in Groningen. This photo, which I’ve lightly retouched, had to have been taken prior to 1943, when Halbo died. I think it’s cute how she has a pillow propping up her feet.